الموضوع في 'منتدى أجهزة الحاسوب والهاردوير' بواسطة AabedKhalifa, بتاريخ ‏أكتوبر 10, 2017. Keeping the system's drives up to date is an important part of OS maintenance. It can sometimes make all the difference when running the computer between low and high performance levels, whether you are tinkering a resource-demanding video game or complex software application. Before taking into consideration the possibility of upgrading the hardware, it is necessary to look at the current status of drivers installed, since a simple update to the latest version (e.g. graphics card) can be all it takes to achieve the desired performance. There are many utilities designed to identify and update drivers, but most of them are pretty pricey. Once in a while, however, you may come across an app that promises great results without charging for anything. 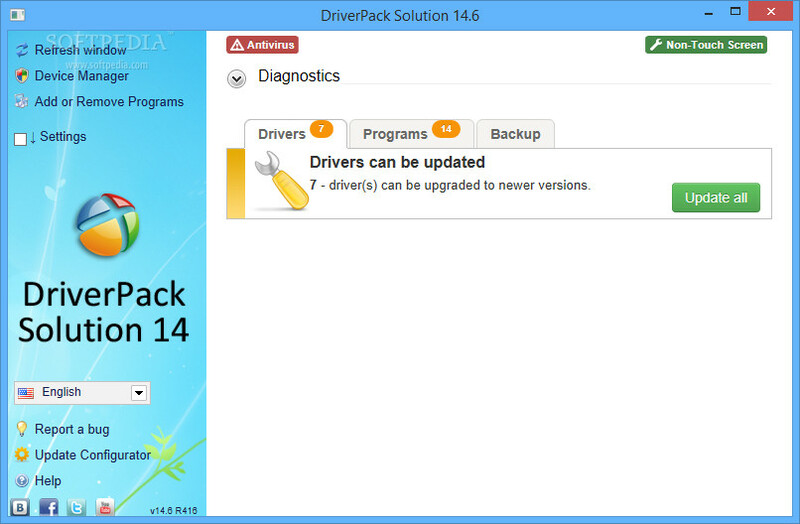 Such is the case of DriverPack Solution, a free and open-source tool that works offline to identify and update drivers. It can be deployed right after reinstalling the operating system, so you don't have to go through the trouble of manually downloading all drivers. The bad news is that the whole package is quite large and it will take a while to download. 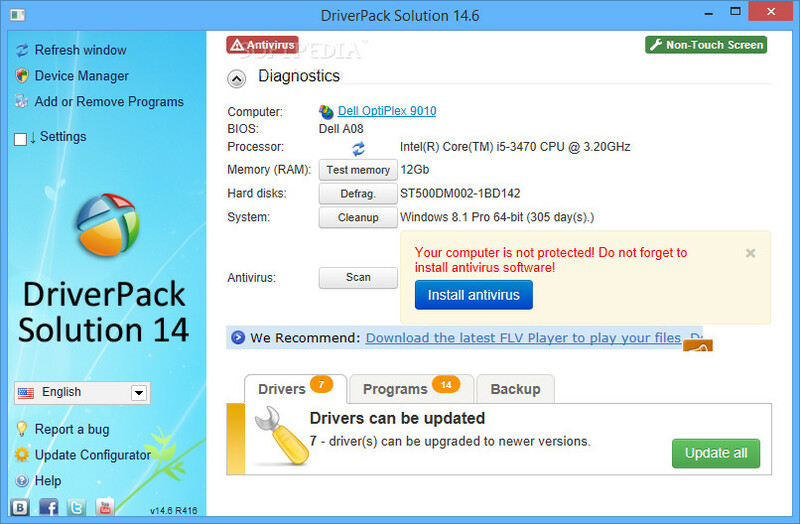 The good news is that installation is not required, which makes DriverPack Solution portable. This means that the executable file can be immediately launched once the ISO image is mounted, in order to use the app. Moreover, by burning the utility to a disc or saving it to an external hard disk, it is possible to quickly run DriverPack Solution on any PC to update its drivers. The interface is pleasant to look at and comfortable to navigate. An initial scan is run at startup to establish the driver status and find out whether they require updates or not. The program also integrates the setup packs of some popular software applications that come in handy to any user, and they can be easily installed. It runs a system diagnostics to reveal the computer name, BIOS type, RAM, hard disk device name, system name, and antivirus status. For example, it alerts users if there is no antivirus application installed on the workstation, lets them run a scan, analyze any drive to remove junk files via Disk Cleanup, defrag the hard disk using Windows' built-in function, as well as test the RAM for any issues. When it comes to getting the latest version of drivers, it is possible to just update them or add the installation of the separate programs as well. Changes can be applied to all volumes, or any of them can be included or excluded from the task. Additionally, the utility can be set to create a system restore point, in order to reset settings to default if any OS stability issues occur after making the driver updates. During the task, the app shows a progress bar for all drivers, along with the currently processed one. A system restart is required after obtaining the items and before their actual installation. 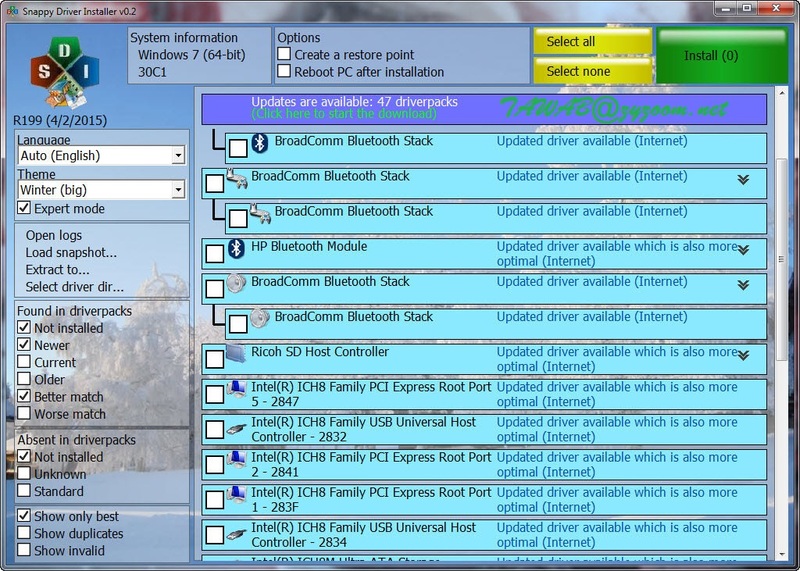 Furthermore, users may access Device Manager without leaving the interface, add or remove programs from the computer by resorting to Windows' default feature, save logs with the app's entire activity to the current folder, as well as back up all drivers from the DriverPack database or the system (to EXE format). Advanced users may switch to expert mode to get a list of all installed drivers, whether they are unknown, obsolete, up-to-date or standard. It is possible to look up driver information manually or automatically on the developer's online database, in order to retrieve the latest version and also inspect information concerning the vendor, operating system, driver date, and version. Instead of the automatic installation, users may perform a manual one. 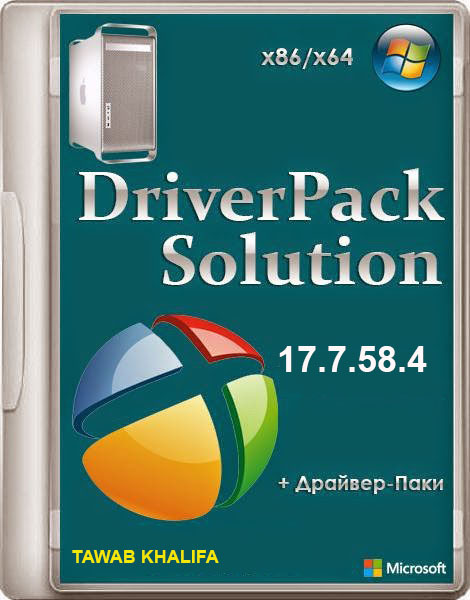 DriverPack Solution offers support for multiple languages as well as 32-bit and 64-bit Windows, XP through 8/8.1. It worked smoothly on 64-bit Windows 8.1 Pro during our evaluation, without causing it to hang, crash or pop up error messages. Driver scan jobs are performed rapidly while CPU and RAM usage is minimal. It is free to use and open source. The main attraction of the application is that it updates drivers offline by resorting to its extensive database, while newer ones can be looked up online. Plus, it is possible to back up and restore the original drivers in case of problems. In case you have just reinstalled a fresh copy of Windows, you can download the latest drivers and install useful applications at the same time, courtesy of DriverPack's software database. Considering its large size, it may take a long time to download the tool. A few extra features are actually shortcuts to Windows tools. The app failed in its attempt to update several drivers. Taking into account that it is free, anyone can test DriverPack Solution for themselves to find out whether it is effective or not. Our evaluation has not revealed any noteworthy stability issues. Those who do not have patience to download the DVD-sized full package may resort to a lighter version called DriverPack Solution Lite, which is also free. However, it is ad-supported and does not include database drivers, software and diagnostic tools. Every device requires a dedicated driver in order to let you use it at full potential. It is a pain to manually update each computer device, but there are applications that can do this for you. SlimDrivers is a driver managing software solution that provides full control over the installed drivers, with dedicated tools to update any system driver on the go. The interface is pretty eye-candy and easy to use, with the home tab showing information on the operating system, computer name, processor, and memory. You can either search for drivers to update, access options, backup or restore drivers, all with a single click. If you wish to uninstall specific drivers, SlimDrivers shows all installed drivers in a very clean way, so it's enough to check the entries you want and hit the “Uninstall” button to get rid of them. On the other hand, backing up the existing drivers takes only a few minutes and it lets you select the files you wish to save, again with a very clean and intuitive interface to make everything a breeze. SlimDrivers boasts a rich options menu that let you configure both the backup and restore utilities, but also the update and scheduling utilities, allowing you to pick download locations and connection settings. All in all, SlimDrivers is a really useful software solution that makes working with drivers a lot easier. It manages to detect most outdated drivers and relies on an intuitive interface to address all types of users. Whether or not you have just installed Windows, you might want to give this powerful application a try. You are probably familiar with having a hard time finding drivers after a clean install of your operating system. You can install them from driver discs that the PC manufacturer probably provided you with or you can search on the product's website. However, there is a more convenient way to identify and download missing drivers: relying on third party software. 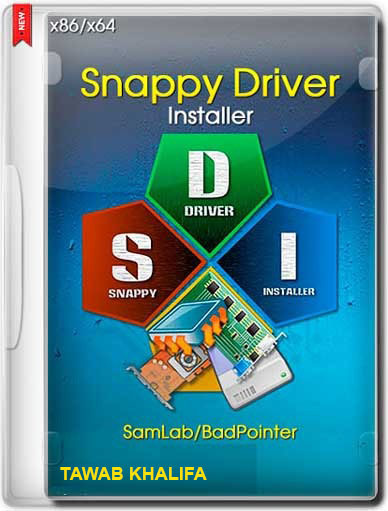 One of the applications that can help you achieve that is Snappy Driver Installer. Given that it is a portable application, no installation is required, it does not modify Windows registries, nor does it create additional folders. This application comes with a minimalistic design that displays all the driver packs that it detects as missing from your computer. Although no additional configuration window is provided, you can toggle the Expert Mode, which activates a series of settings related to item visibility. For instance, you can toggle the application to display drivers that are newer, current, older or that are not installed at all. Additionally, you can set it to show only the best solutions and also duplicate or invalid entries. Snappy Driver Installer can easily create a system restore point, in case something goes wrong during the driver installation or you are not satisfied with the result. Hovering your mouse pointer over any driver pack in the list displays in-depth information regarding the installed one and another one that is available to download and install. These details include the name of the provider, signature, version of the driver, release date and ID. This program generates detailed log files each time it performs an action, be it downloading files or installing drivers, and saves them on your computer. You can easily access them by hitting the corresponding button on the interface. 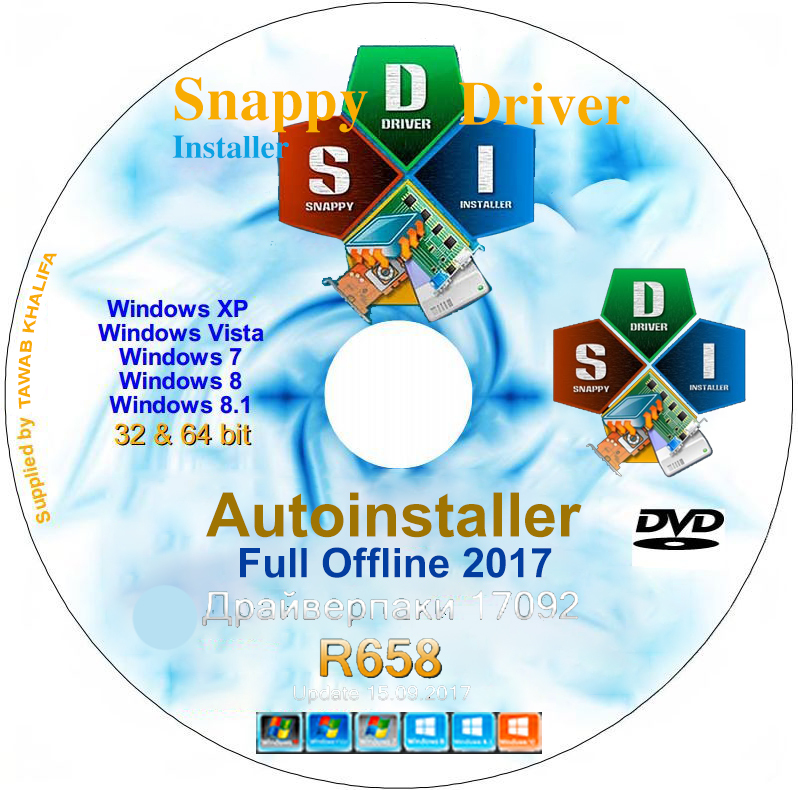 In conclusion, Snappy Driver Installer can help you identify and download missing driver files for your PC in an easy, convenient way. archipro ،حسين القناشي ،M.Sh و 26آخرون معجبون بهذا. AabedKhalifa و Fadi344 معجبون بهذا. AabedKhalifa ،محمد دسوقى1980 و غفاري عماد الدين معجبون بهذا. محمد دسوقى1980 ،Mohammed Abu Elgasim ،karim1949 و 3آخرون معجبون بهذا. AabedKhalifa و النوميدي معجبون بهذا. AabedKhalifa و ابو محمد ومصطفى معجبون بهذا. muntana و AabedKhalifa معجبون بهذا.